Dennis Earl Bradford crept into a Dickinson TX apartment’s window, kidnapped a sleeping eight-year-old Jennifer Schuett, drove her to a secluded field, raped her, slit her throat, covered her with leaves, and left her for dead. Jennifer regained consciousness and called for help but couldn't hear her voice - her voice box had been cut. 12 hours later, one child within a group of children stumbled over her foot and they got her to a hospital in time to save her. Bradford had already served only 4 years in prison (of a slap-on-the-wrist 12-year sentence) for an almost identical crime in Arkansas. This time, he hung himself in his jail cell. Though it's good riddance to that monster, there are countless more out there. 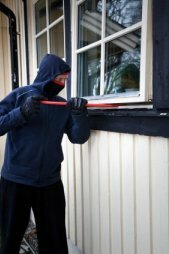 With more than 7,000 home intrusions daily in the U.S. alone (2.6 million annually - per the DOJ), you can see why you need to fortify your windows and doors. Burglars and rapists often peep in the windows of targets to help make their plans. Be very aware of that - especially at night when you have indoor lights on. Cover and lock them always. An intruder entered a Grand Rapids MI apartment’s window left open on a hot summer night and raped a woman he found sleeping there. An intruder crawled through an unlocked bathroom window of a family's Alameda CA home and carried a 7-year-old girl out of the home through her bedroom window. When he lifted the groggy child over a gate, she awakened and started screaming. The screams woke the girl's parents and they ran to her rescue. • Storm windows can be quickly removed by a burglar with a screwdriver. And those with vinyl frames can easily be cut with a razor and removed. • Butterfly locks on the common (double-hung) windows. Older models can be opened from outdoors with a knife-blade slipped between the panels. Replace them with modern window security locks. • Pins: close a double-hung window, drill a hole through the inner panel (on both the right- and left-hand sides where the panels overlap) and halfway into the outer panel, then slip a bolt or nail into the holes. Slant the holes downward so the bolts won’t fall out if jostled. Drill more holes three inches higher to allow partial opening for ventilation. The invaders entered through a rear window of an Asbury Park NJ home and held guns to the heads of Albert Rojas and his family, threatening to blow their brains out, as they ransacked their home. Bill VanMater, neighbor of 17 years, said nothing like this has ever happened here before. Ethel Hugie, living nearby for 35 years, said the neighborhood had always been quiet. Predators have all heard how people in sleepy neighborhoods have sloppy security. Then they’re always so surprised when predators strike. 1. Wired glass has a wire mesh sandwiched between two layers of ordinary sheet glass. Though little more impact resistant than sheet glass, it is used in fire doors to resist intense heat. 2. Tempered glass – such as that used in patio-doors. Different grades are 3-7 times stronger than ordinary sheet glass and resist impact or a glasscutter. 3. Laminated glass has a layer of PVB plastic sandwiched between two layers of ordinary sheet glass. Some grades are impact and bullet resistant. 4. Acrylic (Plexiglas) is 17 times stronger than sheet glass. Some grades are bullet resistant. 5. Polyester window film (or armorcoating) available at hardware stores. The best grades, able to withstand attacks from baseball bats, iron bars, axes, and some bullets, are very expensive. 7. Security Window Guards: Chain-link screens, iron bars, aluminum curtains, window shutters (the "rolling shutters" used on some storefronts), and folding window grills offer fortress-like protection. But the first four can trap you inside thus are banned by fire departments for homes. However, key-operated (from the inside) decorative folding security window grills allow escape IF the key is readily available. Make sure all family members and guests know how to escape through them. Tony L. Putman broke into a Kansas City home through a basement window. He beat and bound a 93-year-old man, raped the 84-year-old woman, robbed them of cash, and escaped in their car. Their son-in-law was shocked that what happens in the news could happen to his family. Basement windows are very vulnerable and must be fully secured. Also secure the door leading to the basement - as described on door reinforcement. Jack McLaren crawled through the pet doors in the homes of two Santa Fe NM women and raped them. 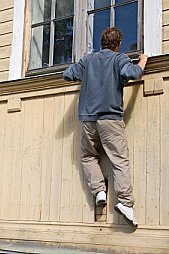 Houses often have other openings that allow a skinny burglar (or child accomplice) to squeeze through. Secure vents with a heavy metal mesh and tamper-resistant round head carriage bolts. Secure cellar doors as described in Door Reinforcement. 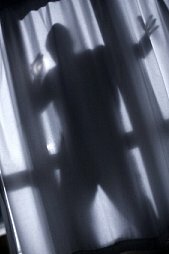 Window air-conditioners can be removed by a burglar from outdoors to gain access. Alarm them with Simple Home Electronics.